Grow your Business with Engineers Edge! List your company on the top engineering solutions web site. 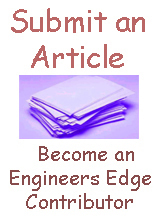 Contact us for more information about advertising with Engineers Edge! Run of site 468 x 60 banners from your own control panel. Add your site to Engineers Edge Directory within the category that best matches your product or service. Your listing will be available to all visitors and included within engineersedge.com and internet search results. Web page that best matches your product or service.